Sitting-Bull on Thu, 09/09/2010 - 10:09pm. New York City and New York sate authorities have the jurisdiction to investigate who was doing what in the WTC towers just before 9/11. All activist activities should be aimed at phoning, faxing and visiting the NYC District Attorneys office with the scientific evidence of explosive incendiaries in the WTC dust and DEMANDING they investigate how and why this material wound up in lower Manahattan. The politically controlled federal government is not required. Aidan Monaghan on Fri, 09/10/2010 - 3:49am. Randy on Thu, 09/09/2010 - 10:55pm. major fail on my part, trying to resize these photos. I tried to edit the whole thing out and start over. that's Robert Bowman, Michelle Phillips and Joseph Culp. Randy on Thu, 09/09/2010 - 11:07pm. Randy on Thu, 09/09/2010 - 11:18pm. Great day at city hall ...the speakers were all excellent and the whole event had a beautiful flow! Please share these photos w/ the speakers and video team, they are downloadable. Randy on Fri, 09/10/2010 - 11:06am. Great photos, Randy! Thanks for sharing. milongal on Sat, 09/11/2010 - 4:21pm. ...... With only 38% support for the war down from 46% in March . The question them BECOMES does this 38% KNOW about the Evidence we have presented here today? And if NOT, WILL You Tell Them? We WILL because we HAVE to. For the sake of the Republic and the Planet. Getting people to ask Common Sense questions about 911 will lead to the inevitable. constitutional911 on Fri, 09/10/2010 - 3:02am. Joe on Fri, 09/10/2010 - 5:41am. 9/11 Truth Crashes News Conference at Dove World to Challenge Pastor on new investigation. Joe on Fri, 09/10/2010 - 5:55am. Forgive me if off topic. We should have an OPEN THREAD here on the NEWS page. Joe on Fri, 09/10/2010 - 6:43am. Is this the only video source? Any source with a stable video camera? world911truth on Fri, 09/10/2010 - 7:37am. This is DJ Green Arrow. 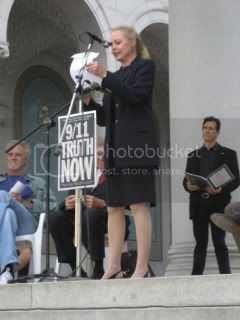 I am honored to be a member and signatory of Artists and Actors for 9/11 Truth. I was one of the presenters yesterday, in New York. I'm uploading stable video to our tech person in France now. it will take a few more hours on my end because of a huge file size, and then I believe a little bit more time on the tech person's end to upload it to everyone. pachamama on Fri, 09/10/2010 - 8:27am. It's good to see that people are inspired to come out with new groups and keep the work going. I hope these all produce positive results and inspire even more people. I know a lot of people are excited about these and have done a lot of work -- congrats for the efforts! My concern, in general, is the ongoing promotions of "no plane" or "no-Boeing" and "Flyover" at the Pentagon, via the various links in each these groups. One site even advocates CIT's Flyover claims, the owner of a site who is now banned from 911blogger, Edward Reynearson of Radio du Jour. 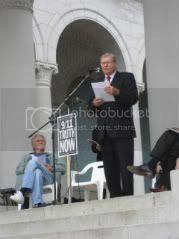 And FYI, the Actors and Artists site has a link to Jim Fetzer's group -- in the Journal of 9/11 Studies banner it goes to 911scholars, a hoax site. I'll email the webmaster. I have to say I'm not surprised to find a link to Jim Fetzer's group buried in here. The minor hypothesis of the paper is that there is no scientific proof that a Boeing 757 did not hit the Pentagon. . . . I have looked for evidence that a Boeing 757 could not have hit the Pentagon and have not been able to find any that stood up to scrutiny. I further contend that this hypothesis still stands. What we've seen over the years is that the no-plane/ no-Boeing ideas are typically a conduit for people like Jim Fetzer and others to plant and grow speculative claims and who then promote and protect more disruptors who advocate nonsense, or a focus on the historical role of Jewish people, or who have a seat with their name on it at FOX News (i.e., Morgan Reynolds), to use to claim that cartoons hit the WTC. On and on. When claims which are deeply flawed are protected and not exposed, they keep everything else which is standing on increasingly strong ground -- year after year -- in a swamp. Last night at the Grand Lake Theater in Oakland we saw even more evidence exposing NIST's claims that demolition could not have taken place as false. Did we see any new evidence for how all the people in DC who saw a commercial jet hit the building were wrong? No. None. These are two very different situations, with one moving forward with increasingly damning evidence every year, and the other being a magnet for hoax claims like "the flyover" and how a taxi-cab driver was "in on it". I know that many are well-intentioned and are doing a lot of work, and we all are glad to see more groups and see the movement growing, which is why I offer a concern toward improving these sincere efforts, not to take them down. Let's continue to move forward with the best we have to offer. Victronix on Fri, 09/10/2010 - 1:57pm. "the Actors and Artists site has a link to Jim Fetzer's group"
At this late date - amazing! I guess some people still consider TV Fakery and "Who's a Jew" to be cutting edge research. That's not the 9/11 truth movement I belong to. YT on Fri, 09/10/2010 - 5:01pm. No one has proved what happened at the Pentagon. All bets are still on the table. Until someone can tell us with certainty what happened, it is ludicrous to start insinuating "this is better than that" or that certain groups or individuals are wrong to provide links to various sites which provide alternative lines of reasoning than those which you practice or support vehemently. Several people have voiced concerns about the paper you reference. Be that as it may, we are all free to write whatever we wish. And if we are scholarly individuals, we must be ready to face and deal with the eventual criticism that comes from our peers. On the surface, they tell us we live in a free country. So let's let people look at the evidence -- as much as they can get their hands on -- and try to make some sense out of what they find. This is not a competition. Everyone is entitled to have their pet theory. To my knowledge, no 9/11 Awards Ceremony is in the works to bestow medals of honor upon those who will have "figured it out". BTW, you might have considered starting this discussion in a new thread. This one is about the joint press conference in NY and LA. How about some mutual respect within the movement? milongal on Sat, 09/11/2010 - 4:19pm. But CIT falsely claims that they have - and therein lies the rub. What Vic is trying to say is, we must reject baseless theories like mini-nukes, particle beam weapons, no planes and flyover. Linking to these sites is bad for two reasons. It is basically an endorsement that gives these baseless theories credibility they don't deserve and links the TM to them. We will all be justifiably painted with the same "nut job" brush if we fail to disassociate ourselves from these baseless theories. Furthermore, I do not want to see the TM linked to "Revisionism" and "Mossad did it" [last 15 min] which what Kevin Barrett and Adam Syed are doing while promoting CIT/NSA and touting the endorsements of you know who. Chris Sarns on Sun, 09/12/2010 - 6:30am. Thanks Vic for again stating what is unpopular but so important! By reducing our claims to the strongest ones we sharpen the campaign. It continually amazes me how little attention so many good hard working 9/11 Truth activists pay to who has done us harm? This is the game people, either we mature or we lose, your choice? John Bursill on Sun, 09/12/2010 - 5:56am. Where is the new evidence? I was hoping to hear about the new evidence mentioned in their press release. Does anyone know what they are referring to? cburn on Fri, 09/10/2010 - 2:01pm. I'm assuming it's in the photos and videos released by the International Center for 9/11 Studies. We saw some interesting bits of video (shown by David Chandler, from that FOIA effort) last night at the Grand Lake Theater that hadn't been shown before. Victronix on Fri, 09/10/2010 - 2:31pm. about the actors project about 10 months ago. I contacted the staff to request a change in title to something less similar to one of my main projects of the past 2 ½ years. They refused. After an effort to make the best of the situation for a while and after observing the coarse of events, I again asked them for a title change a couple months ago. I have been arguing my case in private, semi-private, and public since. I was just watching a great video of a man I met about 25 years ago Zen Master Seung Sahn. He’s very famous in Buddhist circles and in Korea. I heard him say all these things in person. It was quite an experience. So I looked again to him for guidance in this situation. My request to the actors staff stands. I wish everyone good health and success at this critical time. 911ARTISTS on Fri, 09/10/2010 - 4:44pm. Buddhism has many wonderful truths. constitutional911 on Sat, 09/11/2010 - 3:28am. John Bursill on Sun, 09/12/2010 - 5:54am.